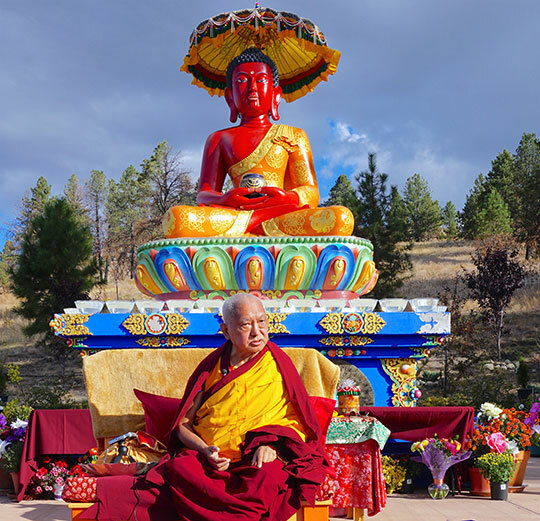 Lama Zopa Rinpoche blessing the sentient beings in Omak Lake with mantras, Washington, USA, October 2016. Photo by Ven. Lobsang Sherab. Schedule – New Events Added! Look Out for Your Invitation to the New Affiliates Area! 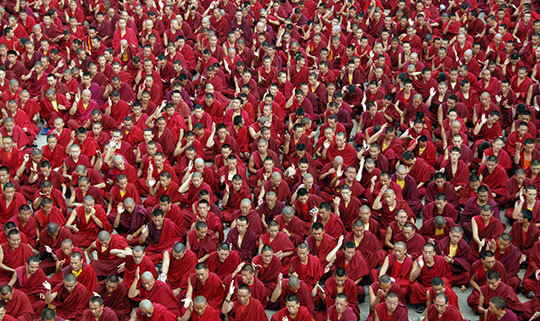 Tushita Delhi to Host His Holiness the Dalai Lama! Golden Dharmachakra. Painted by Gelek Sherpa. Lama Zopa Rinpoche and a cute canine friend, Adelaide, Australia, May 2015. Photo by Ven. Thubten Kunsang. 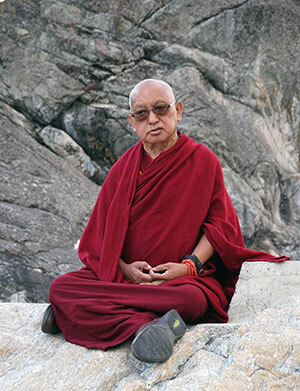 Find a wide range of advice from Lama Zopa Rinpoche on Rinpoche’s Advice page. Lama Zopa Rinpoche teaching before the Amitabha Buddha Festival, Buddha Amitabha Pure Land, Washington, US, October 2016. Photo by Ven. Lobsang Sherab. Subscribe to our FPMT news blog to get updates as soon as they are announced. Enjoy livestreams of many of the teachings above and recordings of Rinpoche’s most recent teachings via Rinpoche Available Now! The long life prayer that Khadro-la (Rangjung Neljorma Khadro Namsel Drönme) spontaneously composed for Rinpoche’s long life is now available in English with Tibetan phonetics, Tibetan, Italian, Spanish, and Chinese. The main topic of the Living in the Path module “Everything Comes from Mind” is summed up by Lama Zopa Rinpoche: “The view of Buddhism, Buddhist philosophy, the very foundation, the very essence, is that everything comes from your mind.” In a short video, “Mind: The Creator,” Ven. Robina Courtin, one of the senior FPMT teachers who have offered video teachings for Living in the Path modules, introduces the Buddha’s explanation of mind and karma. Lama Zopa Rinpoche recently offered some inspiring advice about the benefits of offering to ordained Sangha, the monks and nuns of the Buddhist tradition. 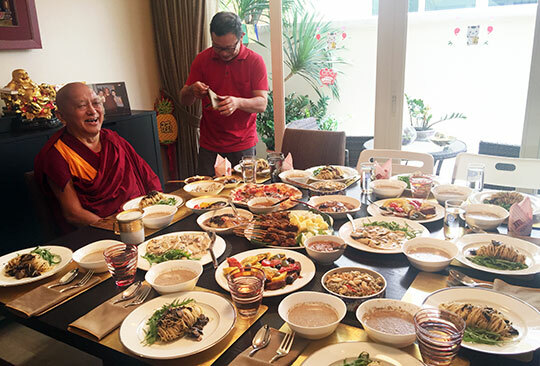 The Supporting Ordained Sangha Fund provides support to ordained Sangha as well as to monasteries and nunneries; the Sera Je Food Fund, now in its 25th year, offers three vegetarian meals a day to the monks studying at Sera Je Monastery; and the Lama Tsongkhapa Teachers Fund provides support to the most senior teachers of the Lama Tsongkhapa tradition and offers financial backing for the annual Gelug exam and winter debates in India and Nepal. The Friends program is a key source of funding for many activities, including FPMT Education Services, which supports the Dharma study and practice of tens of thousands of students worldwide through print, audio, video and online Dharma publications and programs. The Education Services team works year-round on new projects and existing programs like those found in the Online Learning Center. Friends of FPMT help further this work, and also enjoy open access to lots of these Dharma materials – plus the new Mandala magazine coming out next month! Consider becoming a Friend of FPMT supporter today. This advice is specifically for those offering service in these roles. 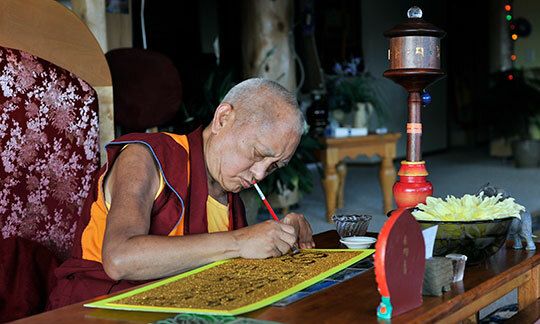 Lama Zopa Rinpoche writing a mantra, Washington, USA, September 2016. Photo by Ven. Lobsang Sherab. We are delighted to announce that the new FPMT Affiliates Area will be available soon. 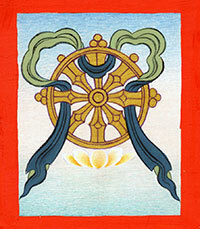 This online resource will replace the FPMT Affiliates Area, and is essentially the FPMT Handbook completely online. The Affiliates Area has been designed to make finding the information you need easier. We’ll be emailing you soon to set up your unique Affiliates Area account. On December 11, as part of its Delhi Dharma Celebration, Tushita Mahayana Meditation Centre will host His Holiness the Dalai Lama for a talk about compassion and secular ethics in the world today. Tenzin Rigsel Rinpoche, who was recognized by His Holiness the Dalai Lama in April this year, will be enthroned on the March 6, 2017, in a grand ceremony at Kopan Monastery, Nepal. If you would like to attend, please click here to register for more information about the event. An FPMT Foundation Service Seminar with a Facilitator Training component will be offered February 3-10, 2017 at Land of Medicine Buddha, California, USA. Click here to register! Mahamudra Centre, New Zealand, has a variety of volunteer opportunities; Maitreya Instituut Loenen, the Netherlands, is looking for an experienced chef.